Rupees 12,000 will be granted to 20,000 selected candidates for a period of six months. 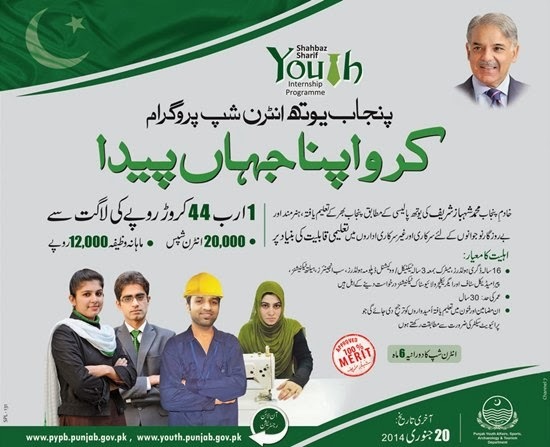 This program is aimed for educated, skilled and unemployed youth of Punjab. This program will cost about 1.44 billion rupees. Applicants, who have education and skills in the fields which are compatible with private sector requirements, will be preferred. Selected candidates will be temporarily placed in relevant organizations keeping in view their field of education and expertise. A certificate will also be awarded upon successful completion of internship. PYIP is an initiative of the Punjab Government to train the unemployed youth with useful skills to obtain better employment opportunities. Skills of the youth will be enhanced through training and to give a chance to apply theoretical knowledge in the respective field practically. Age limit is 30 years for applicants. Last date of application submission is 20 January, 2014. How to Apply for Punjab Youth Internship Program? Its just a lier program, no single person get that sochlarship, except the politicians reference.